I’m not a collector of shaving items….. or am I? Can you use your collection and still call it collecting, or at that point are you a user? I’ve never really thought of myself as a collector and even traded away a vintage DE stropper because it didn’t work, but I love old brushes and that makes up almost half of all my brushes and I love how the SE razors look and I used them all. I don’t need any of them. I could go with the first razor, Merkur 23c, and not have any other razors. 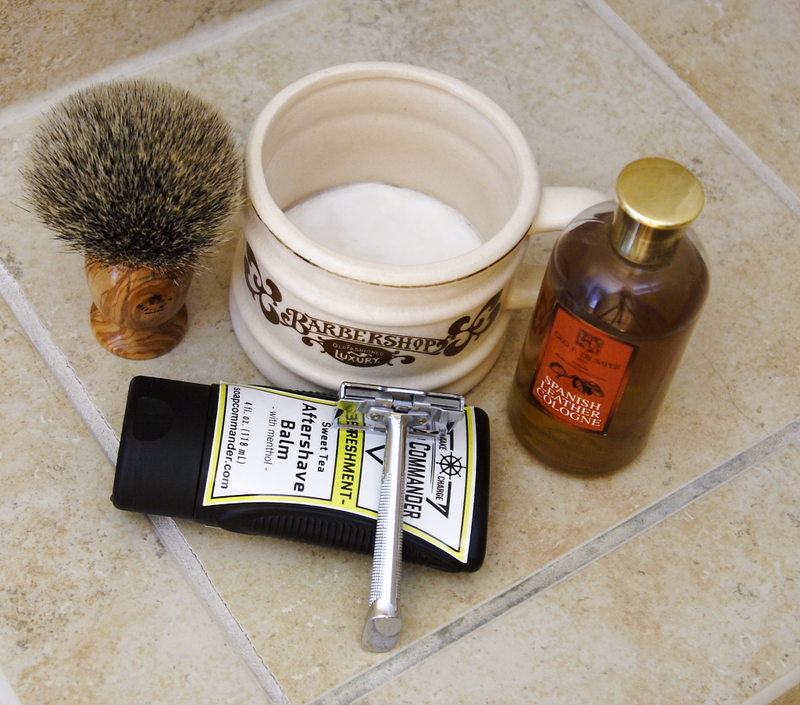 I could have stayed with just my Parker best badger and no other brushes…. but I didn’t. There is something about holding a item that can be up to a 100 years old and fully functional and using it. A while back I got a 1960 or 70’s Aqua Velva gift set because it had Redwood. My idea was to use it and when finished to throw the bottle away, but the more I look at the 4 bottles the more I like just looking at them. I have entertained the thought of using it till nearly gone and then shelve it. 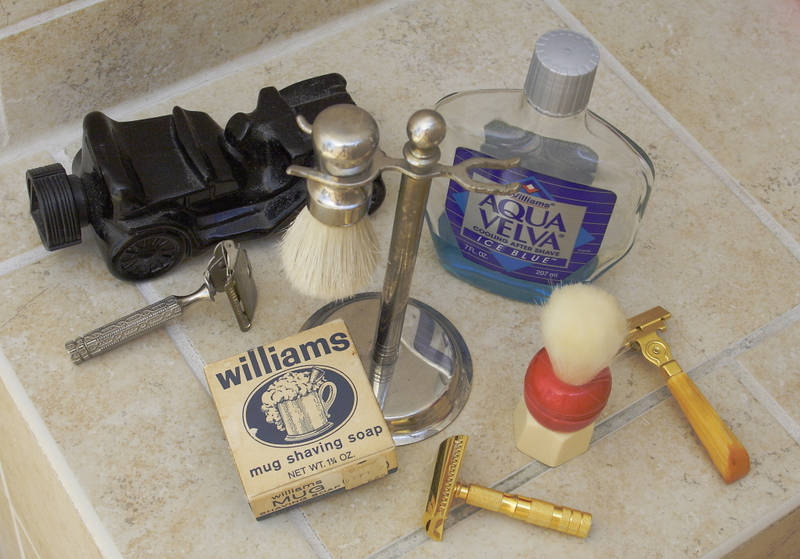 I was just messaged by another traditional wet shaving bro and found he is sending me a pewter 1976 Williams mug. I seem to be getting quite a collection of J. B. Williams Company items. Should I get a glass display to put these in? Would anyone even bat an eye at it? We hardly have company anyway. Am I just stroking my own ego? Do I secretly wish to have a real MAN CAVE? I just don’t know. So. Are you a collector, user, both and why? So I’m continuing this idea of Arko all this month of August, unless it runs out. I am starting to think that yesterday was indeed helped by the quick shower beforehand. I don’t think it is a hydration thing, but more of starting with a clean face. Today I simply lathered right to my dirty face and did 4 passes. Grabbed a hot shower after and toweled off. Face looked great, noticed some stubble on my neck that I missed and while dry I put the Gem blade in and lightly knocked it off with a dry clean face. Surprisingly it feel fine and smooth and great. Rinsed off just in case and put on some balm as Arko doesn’t leave my face feeling conditioned. It’s Sunday so that means Spanish Leather! Yeah baby!